After a cancellation and a postponement due to weather, our new Sacred Band finally debuted on Sunday, March 4th at the Christ Lutheran Church in Hellertown, Pa. What began a long time ago as a vision finally came to fruition as we performed for the wonderful congregation of the Christ Lutheran Church. Like I said in my previous blog, our 17pc. big band that plays in churches is AWESOME, but, the size and logistics of programming that can be an issue and very difficult to schedule. 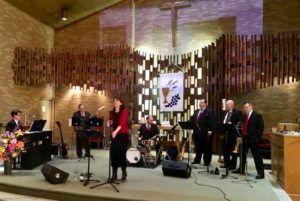 So, when the interest came from Christ Lutheran to book sacred music, we felt the need to move in a different direction. A direction that would feature a smaller band which is easier to adapt and book for a wide variety of churches and their facilities. The new 7pc. band features vocals, piano, bass, drums, trumpet, sax, and trombone. Although I am the leader of the band, the featured instrument is the vocalist, which is very capably handled by my sister Linda. Whether singing solo or leading the congregation in song, her energy and praise of the Lord is unmistakable. Although we were dealing with the winter blues from the recent rash of storms which left many without power, she wiped that away and got many up on their feet to worship the Lord in Praise! Backing up Linda was a driving rhythm section featuring Steve Wysocki, Tom Mondschein and Mark Marina. Steve, who is the Minister of Music for the church, played keyboard and did a great job. This band was new for him and his excitement was contagious to all of us. Tom played Bass and has been with the big band for many years. Sitting behind the drums, Mark kept the feel and drive throughout. On the other side of the band was the horn section that added pop and sizzle to the songs. 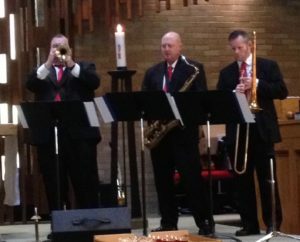 The section consisted of myself on trumpet, Ricky Paetzell on saxophones and Dustin Hartman on Trombone. The three of us have played together for many years in the big band and it was a pleasure to join these two well-trained musicians in the section once again. The band jelled together on so many levels. You could definitely feel the sense of joy and satisfaction as this project, which has been in the works for quite a while, finally happened. One neat aspect about this band is that we have an eclectic playlist of music. 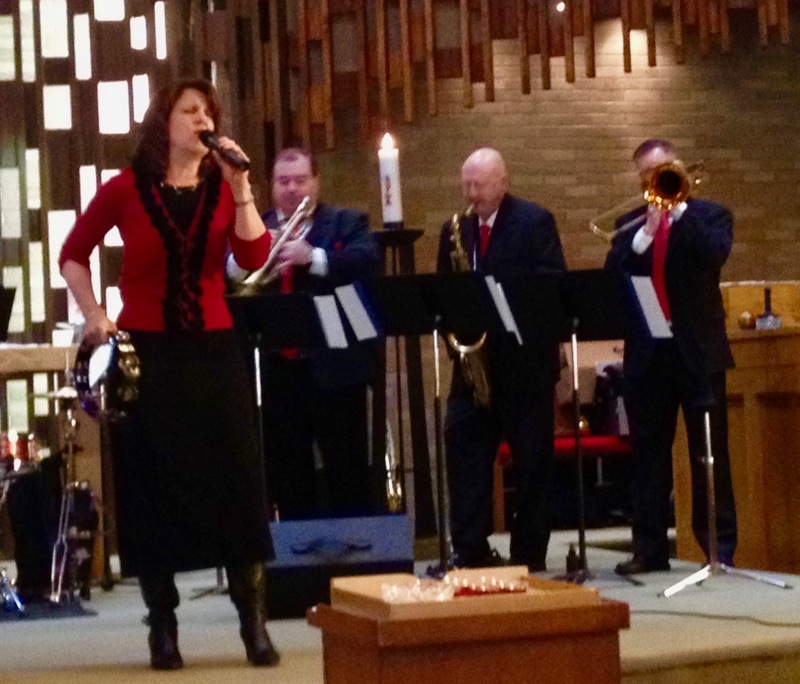 We play revered standard hymns, contemporary praise and worship songs and even jazz influenced hymns. We began the service with a beautiful quartet arrangement of It is Well With My Soul. 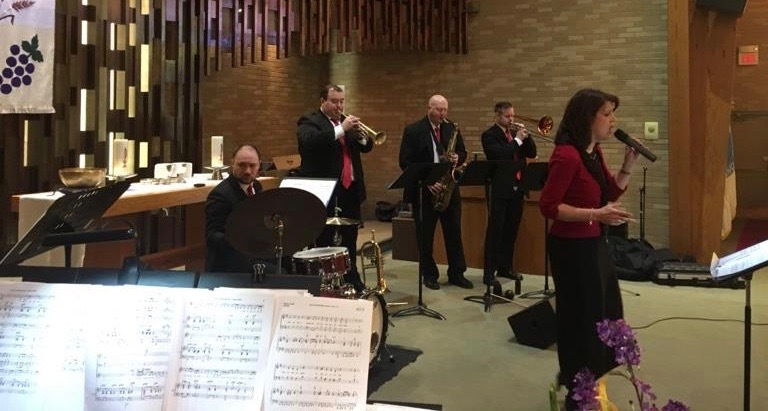 Led by the flugelhorn, this arrangement was a perfect vehicle to calm the mind and to be able to mentally prepare for the service. We then had the congregation join us on Stand Up and Bless the Lord and All Hail The Power of Jesus Name. These 2 are great for anyone to join in as it combines a fun newer contemporary song with one of the most all-time favorite hymns. After the sermon, we had a chance to stretch our chops a bit as we were featured on Oh, Happy Day! This was performed in the style of the song as heard in the movie Sister Act 2. This bluesy rock feel was fun to play and easily a crowd favorite. They couldn’t help but to clap along and move in their seats to this song. We then had chance to play for their communion. We chose Christ is Reaching Out. A really pretty jazz ballad by David Arivet, Linda did a great job capturing the feel and style of the song backed by a solid arrangement. We finished off the morning with a nice version of Crown Him With Many Crowns and reprised Stand Up and Bless the Lord as our postlude. I can’t say enough how gracious and generous Steve, Pastor Phil and the rest of the members of CLC were to us. They are very welcoming and I am glad we were able to debut with them. We are very thankful to them for all they did for us. We hope we can do this again with them in the future. So, where do we go from here? We have photos, a video and are now ready to begin seeking opportunities. 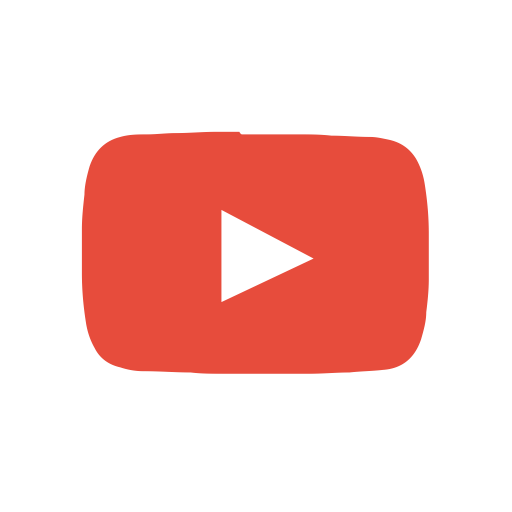 We want to spread our music and our vision with as many churches as we can. 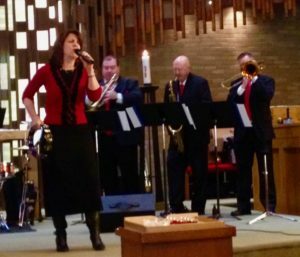 Whether it is during a service or for an evening show featuring the band, we welcome a chance to share the praise at a church near you. Please call me at 908-619-4502 or visit www.vposwing.com or www.vincepettinelli.com to bring our band to your church. Previous Article Previous Article: Praise & Worship with our new Band!